This week I have been overdosing on True Entertainment (Channel 61's) back-to-back episodes of Little House on the Prairie and The Waltons as I battle the dreaded lurgy. I have thoroughly enjoyed this trip down memory lane as I have not seen either series since I was little. And for all the perceived mawkishness, both series dole out some tough love and some surprisingly gritty storylines crop up in Little House on the Prairie. Both series were hits around the world, especially Little House. People internationally it seemed, could not get enough of the portrayal of a happy functional family who stuck together through thick and thin, not least one assumes, if they did not have one of their own. Perhaps this had always been part of the appeal for me too I mused, since my own childhood home situation was far from happy. Both series were embarked on with trepidation after the mores of the 60s, but the TV companies had underestimated the public appetite for a return to the values and clear black and white morality of earlier ages, before the nuclear family began to be nuked and life became so ridiculously complicated. Since the demise of these series in the early 80s, TV has largely returned to its assumption that only the salacious or an endless misery fest will keep up us glued to our screens. Not so for this viewer who yearns for more intelligence, more imaginative use of language and better stories on screen. By sharp contrast, the elongated commercial breaks on Channel 61 alternate between ever more gambling advertisements and ever more loan company advertisements touting loans for a mere zillion percent, with yet a third breed exhorting you to sue everyone for everything that's ever gone wrong in your life on a no win, no fee basis! - the complete opposite of the family values portrayed by the series they are screening! Is this sheer ignorance of their viewing public on the part of a new broadcasting kid on the block, or a cynical attempt to tempt those who wouldn't normally be interested in such dodgy money raising attempts to succumb? Which led me to wonder how many people are taking part in online gambling to win enough to pay their bills, then getting into even deeper debt, necessitating yet another loan? Do they then fake an accident to sue for compensation? How does it work? In Victorian times people were sent to debtor's prisons for being in debt. Now debt has been rebranded 'credit' and individuals can only build up a 'credit record' by incurring and managing a sizeable amount of debt! Unless they fail, in which case they can now STILL obtain a credit card with a bad credit rating, if they're prepared to overlook the mere detail of a zillion percent interest. What a crazy world of deferred consequences dressed up as advantages. And what an alarming thing it says about our country if our greatest home-grown products are now gambling, debt and sue-age. Worse still, it's a bubble that's bound to burst when everyone is declared bankrupt who embarks down that slippery path to ruin. Economically, we are meant to be in recovery now, yet at the weekend I find that Brighton has CLOSED its tourist information office, directing all the city's millions of visitors to a website address, and now London Transport has declared it is closing all manned Underground ticket offices within two years. Human beings are disappearing fast, but where to, and how is this helping the economy when more and more companies are seeking to reduce staff, even if they can well afford to continue providing human services (London Transport is not known for being broke). How do people who've lost their jobs or those who are so cash-strapped with bills, they have no disposable income left to spend on non-essentials or in the High Street, support the economy and its recovery? In the same week I read that one-in-five families now cannot afford to pay all their bills, a rise of 800,000 from this time last year, yet the government is still refusing to do anything to cap exorbitant rents, energy bills, rail fare rises and petrol prices. 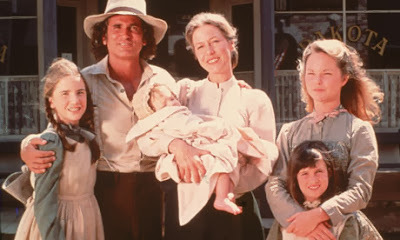 What would Charles Ingalls do? Perhaps Little House on the Prairie and The Waltons can teach us how to be poor and build our own houses out of planks as well as how to have happy families. I fear for modern generations, I really do. Shallow values and shallower expectations all reinforced by the sickly glow of television and internet advertising. This house of cards is going to come crashing down I fear.